For music teachers, Christmas is just around the corner (you have to have time to learn a tune if you want to impress everyone with it at Christmas) and Conrad’s Chords has had a request! A Christmassy duet for piano and ukulele. Mele Kalikimaka (Hawaiian for Merry Christmas) is a brilliant ukulele song, and perfect if you’re looking for a different take on Christmas that is really upbeat and goes with a swing. Here it is arranged for piano and ukulele with key options, although I think it goes best in the key of D.
And here with just the tune line and ukulele chords. Strum it on the off-beat to make it swing. I have it repeating once, but of course you can go round as many times as you like, and vary it in whatever way you desire! The song was written in 1949 by Robert Alex Anderson, a Hawaiian born composer who sounds to have been quite a character. There was even a film made about his feats of derring-do as a fighter pilot in the First World War. 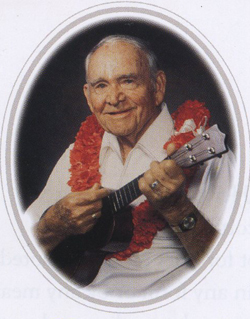 Anderson wrote the song after someone had questioned why there weren’t any Hawaiian Christmas songs. I’ve just learned from Wikipedia that ‘Mele Kalikimaka’ is a just how ‘Merry Christmas’ comes out if you put it into the Hawaiian tongue. 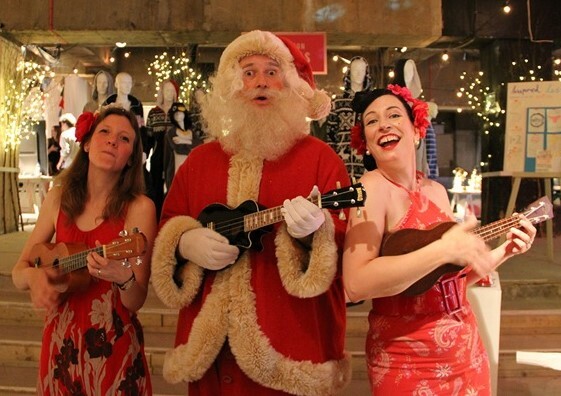 Bing Crosby recorded Mele Kalikimaka with the Andrew Sisters, which is the classic version. But I love love love KT Tunstall singing it. What a phenomenal musician. I first became aware of this song whilst doing a four year stint with Tricity Vogue each Christmas in a shopping centre in North East London, welcoming Santa to his grotto. I also ended up singing it with her in a department store in Central London in the middle of July (above pic). She gets me the weirdest gigs. This entry was posted in charts, Christmas, music teaching, piano, singing, ukulele and tagged chords, christmas, Mele Kalikimaka, Robert Alexander Anderson, sheet music, song, ukulele, ukulele and piano duet. Bookmark the permalink.